The move comes after for-profit drug companies have forced major increases in drug prices. Four not-for-profit hospital networks are joining forces to form a new generic drug production company. Together, the four systems own 10 percent of hospitals in the U.S. 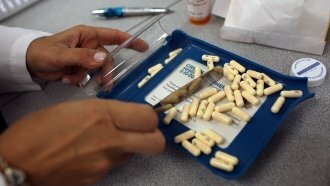 They say they hope to lower generic medication prices, which have seen major increases in recent years. Those increases are partly because existing drug companies started buying rights to older drugs and bumping the prices up. The new alliance hasn't said what drugs it intends to produce because it doesn't want other pharmaceutical companies to undercut it temporarily and return to high prices later. The Department of Veterans Affairs is also on board for the project. It's not providing any financial support but it's interested in becoming a customer of the new company.